I've been wanted to arrange my photo frames in my living room by putting them all together in one place. I have frames a bit all over the place and it's starting to annoy me. I'm always giving people the advice to organize stuff, so this would be the right time to be organizing these photo frames shelves. 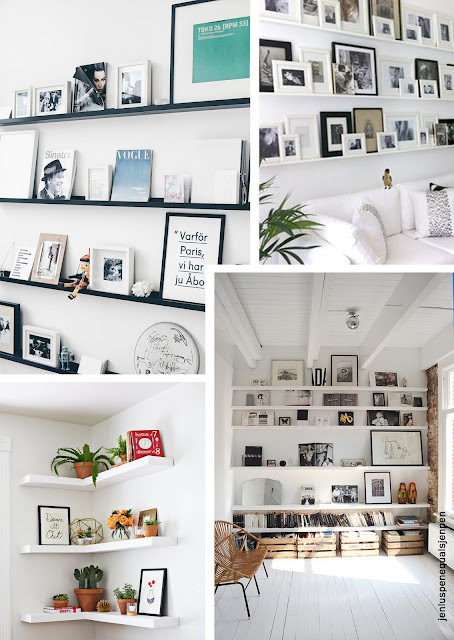 Yesterday I was in one of the many IKEA's in Holland and I saw the photo frames and these are just the greatest invention to create style in your space by putting your frames together and to add extra elements to make the wall shelving pop. It's a great way to combine your photo frames with art, plants, books or little decor pieces, like things you find or buy on your travel adventures. This way you won't have to drill a hole for every frame you want to hang up and that is surely a big relief. When I'm back on the island I'll be going to work on this project. Will keep you posted. How do you organize your pictures and art pieces all together?